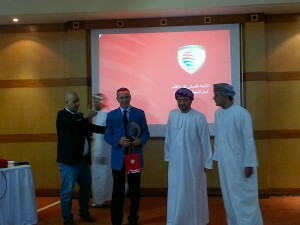 Organized by the Oman Football Federation, on the 19th and 22nd of January of this year, a Course intended for referees, assistant referees and referees’ observers of the highest categories took place in Muscat (Oman). José María García-Aranda was invited to participate actively in the theoretical and practical sessions. During these, matters in reference to the Rules of Game and about the Refereeing Technique and Tactic were discussed. The course was of great interest and the high motivation of all the participants contributed to the success of an important refereeing activity, in a country which is developing football with close attention. To the events related with this course came the President of the Federation, Khalid Bin Hamad Al Busaidi, together with other representatives of the Federation and Football clubs.